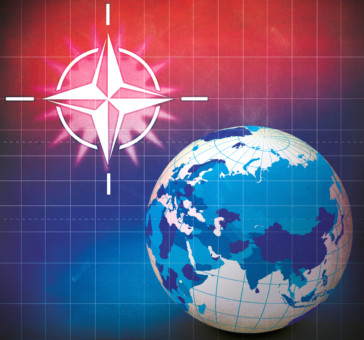 In April, the North Atlantic Treaty Organisation (Nato) will celebrate its 70th birthday. Founded in the earliest years of the Cold War, it is just as relevant today, when many feel that the international order is shaken again. In fact, if Nato did not exist, those in favour of a free world would have to invent it. While Nato’s key purpose remains to guarantee the security of its members, it has never been a purely military alliance. It is a political alliance as well, based on the common aspirations of its members who, “are determined to safeguard the freedom, common heritage and civilisation of its peoples, founded on the principles of democracy, individual liberty and the rule of law”. These principles are under assault today. Russian aggression in Eastern Europe, Chinese assertiveness in the South China Sea, the terrorism of Daesh [the self-proclaimed Islamic State of Iraq and the Levant] spreading from the Middle East to the capitals of Europe, authoritarian regimes developing nuclear weapons — as different as these challenges are, they have one thread in common: They emanate from actors who oppose the international order. They try to undermine or even change the rules that have governed the age of democracy and prosperity since the Second World War. The democracies of Nato need to stand together to overcome these challenges. Collectively, we are stronger than even the mightiest of us would be on her own. Accordingly, since 2014, when Russia invaded Ukraine, Nato has adapted to the situation at hand — as it has done many times in its history. Among 29 sovereign states with different political cultures and points of view, such adaptations will always be complicated, and sometimes even messy. But Nato’s ability to change its priorities and its strategies ensures that the alliance will stand the test of time. The results are tangible. For one thing, all European members of Nato have increased their military spending. The German defence budget, for example, today has increased by 36 per cent compared to when I took office in late 2013. We still have more to do to fairly share the burden within the alliance, and we are prepared to do more. But we also keep in mind that burden-sharing is not only about cash, but also about capabilities and contributions. Germany is thus, as the second-largest troop contributor to Nato, proud to lead Nato’s Very High Readiness Joint Task Force. Nato has also increased its presence in Eastern Europe, plays an active role in training Iraqi security forces and contributing surveillance to the fight against Daesh, continues to support the Afghan government and develops its partnerships with like-minded nations such as Australia and Japan, in addition to much more. In fulfilling its three core tasks — collective defence, crisis management and partnerships — Nato is an irreplaceable building block for an international order that favours freedom and peace. Most of all, Nato is not a trans-Atlantic organisation in name only. It represents a special, even emotional bond between the American and the European continents. For a German, images of the fall of the Berlin Wall are inextricably linked with the alliance, and my country is particularly grateful for the security and the opportunities Nato has been providing for decades. So yes, in addition to the practical benefits of bases, structures and troops, Nato has a value in and of itself. Maybe the most basic benefit of Nato is that it provides reliability in an unreliable world. Our unshakeable commitment to Article 5, the Nato treaty’s collective defence provision, ensures that our common security is truly indivisible. We will help our weakest ally just as we have helped our strongest by invoking Article 5 — for the first and only time in Nato’s history — after September 11, 2001. So it is a good thing that the European Union is now undertaking significant steps to enhance its military prowess. If members of the European Union succeed in harmonising their defence planning and military procurement, and in intertwining their armed forces, then all of this will add to Nato’s strength. And a stronger Nato will serve the security interests of all members. Most of all, it will send a clear signal to those opposing the rules-based international order: We trans-Atlantic allies are ready and willing to defend our soil, our people and our freedom. Ursula von der Leyen is the federal minister of defence of Germany. Are we becoming technological zombies?